Some things are meant to be together! In the spirit of February Valentines, it is the perfect opportunity to talk about foods that go well together. All foods that go well together are because of the way your palate tastes food. Whenever I create a new dish I always make sure it is balanced: Does it have enough fat vs. acidity? The reason peanut butter and jelly pair so well is because the peanut butter is full of good fat and the jelly has sweetness balanced with acidity. These matches work because your palate gets cleansed with every bite and you are ready for more and more and more! Think about having a triple chocolate cake with no raspberry sauce; it gets heavy and weighs on your palate something fierce. For more on this subject, read my buddy Kathy’s blog which dives into Matches Made in Heaven. My favorite seafood pairing is bacon and scallops. The lean clean flavor of the scallop holds up nicely to the salty smoke of the bacon. This dish really makes my heart sing like when I come into my house and my boys yell “DADDY!” and run to the door greeting me with big hugs. Sear the scallops to golden brown on either side. Place the pancetta relish in 6 dots on the plate. 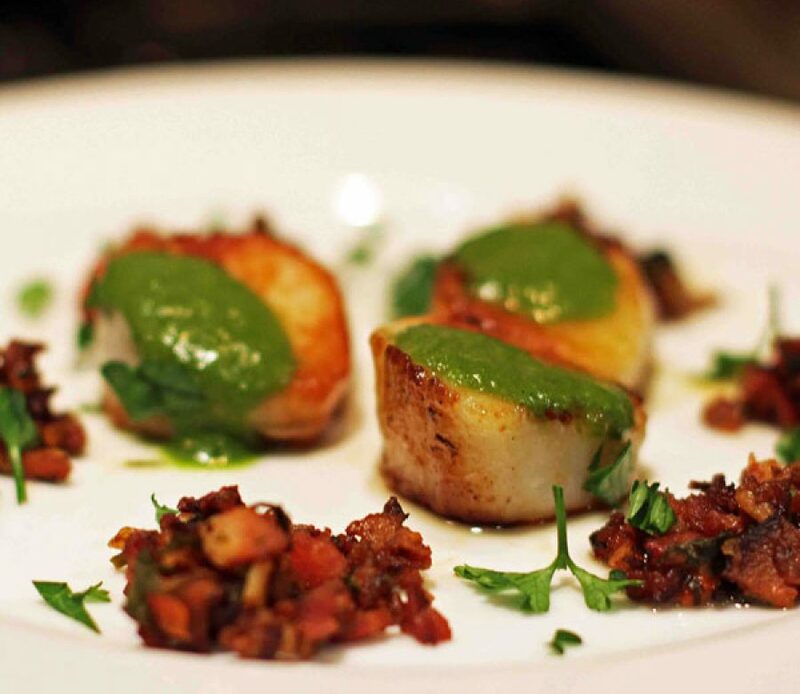 Top each scallop with the chimichurri sauce and garnish with the chopped parsley. Place the bacon in a cold saute pan and cook until crisp. Place the peppers and onions in the pan and cook until soft. Add the chopped garlic and toast. Add the cilantro and cider vinaigrette and keep at room temperature until serving. In a blender place the red wine vinegar, garlic, jalapeno, cilantro, honey and green onion. Blend on high until fully chopped. Drizzle in the canola oil and finish with salt to taste.